In our recent report [pdf file here] into woodland ownership we found that financial gain had a much lower level of importance than factors like conservation, wildlife and wanting to ‘get away from it all’. Less than half (40%) of the owners we surveyed said that the purchase of the wood as an investment was quite or very important and only one in ten said that its purchase for tax purposes was important. Half (51%) said that having the wood as a retirement project was very or quite important, and we are often approached by individuals in this stage of their lives. 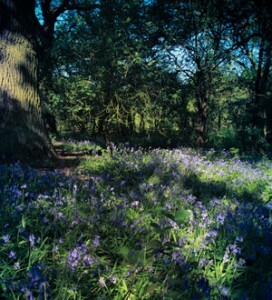 They often have access to a lump sum via their pension pay-out and with today’s low interest rates they view a wood as a living investment which they can share with friends, children and grandchildren. 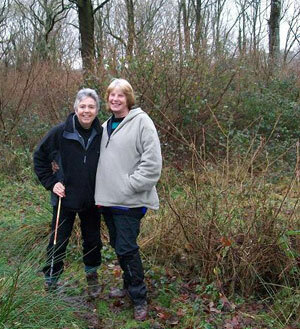 Stephanie and her partner Jill bought Rainbow Wood in West Sussex after Stephanie retired from full time work and couldn't imagine herself pottering round the garden for the next 25 years. 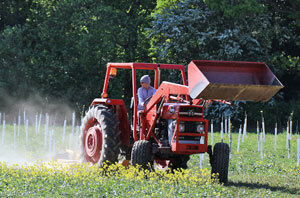 Stephanie says, “We are certainly not wealthy landowners. We're just 'ordinary' working folk. When I retired I had a lump sum pay out as part of my pensions. It seemed prudent at the time to invest the money in land as the stock market was too volatile, and the building society was paying meagre amounts of interest. We hope that the value of the woods will go up, but that was not the major consideration. “We felt it would always have some value - even if it wasn't quite what we paid for it, but so far though I don't think we have to worry on that score. Buying the woodland seemed far more sensible than buying a camper van or a canal barge or a 'fast car'. It's somewhere we can spend as much or as little time as we want, doesn't cost us anything to run and will last many lifetimes. “It's our little bit of heritage, gives us great pleasure, and many hours of enjoyment. It provides us with everything from logs for the fire to a 'get away from it all' haven, and a place to share with friends and family. Camping overnight in there is great fun; watching the rooks come home to roost, the sun setting through the trees and then being woken in the morning by the dawn chorus from all the woodland birds we have encouraged.” Read more about their tales of woodland ownership on their blog [http://wallisthecat.blogspot.com]. It’s quite interesting to see how many woodland owners blog about their woods – and sometimes very eloquently. The lovely post on http://docsquid.blogspot.com/2011/07/simple-little-things.html reminds me of the Norwegian poet Wergeland’s words “look closely to fathom / the greatness of the small”. Perhaps you ought to keep a links page pointing to all woodland buyers’ blogs that you know about? P.S. Stephanie and Jill’s link should probably point to the main page of their blog – http://wallisthecat.blogspot.com/ – rather than to their newsfeed.